Rail is a key component of our national supply chain. Rail transport – whether it be freight or passenger – has gone through a period of significant adjustment and continues to respond to new technologies and the demand for greater efficiency and reliability. This opens the door for fresh ideas, new approaches and different ways of thinking. As a national business in a sector undergoing rapid, positive changes, ARTC offers a diverse, challenging and exciting working environment. We continuously strive to improve our business and surpass customer expectations. Creativity and innovation are driven by our team and our people are central to our ability to evolve and grow into the future. Our network crosses the breadth of the country and our team members are as local as they get. We live and work in the communities in which we operate. Whether it be maintaining signals, accounts or engineering standards and whether you are based in the city or in the country, there are exciting opportunities on offer for your future career. If ARTC sounds like somewhere you’d like to work and you can demonstrate creativity, innovation and drive in your area of knowledge, follow the links on the left to find out more. ARTC seeks to continually improve gender balance and encourages applications from females for non-traditional roles. 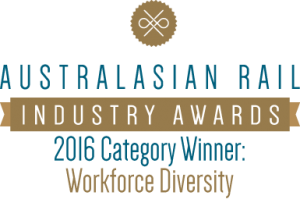 ARTC recognises the need for diversity in the work place.